What's going on with the market? Tech stocks, which have surged all year, are tanking. But some of the market's biggest laggards of 2017 -- such as retailers, banks and airlines -- were all rallying sharply. Up is down. Black is white. The Dow hit a new all-time high Wednesday thanks to growing hopes for tax reform and bank-friendly comments from Jerome Powell, President Trump's nominee to succeed Janet Yellen as Federal Reserve chair during his Senate hearing Tuesday. The Dow is now up more than 20% this year, and is not far from the 24,000 milestone. Transportation stocks were surging, led by big gains in airlines Southwest (LUV), Delta (DAL) and JetBlue (JBLU). That's despite a recent spike in oil prices. And many beaten-down retailers, companies like Macy's (M), Nordstrom (JWN) and Target (TGT), were among the top gainers in the S&P 500. Meanwhile, big tech stocks -- which have propelled the market higher all year -- were tanking. The Nasdaq fell more than 1%, led by big drops in Google (GOOGL) owner Alphabet, Amazon (AMZN), Apple (AAPL), Facebook (FB) and Netflix (NFLX). Momentum darlings Nvidia (NVDA) and PayPal (PYPL) and red hot gaming stocks Electronic Arts (EA) and Activision Blizzard (ATVI) plunged too. They have been some of the market's top stocks throughout most of 2017. Jeffrey Saut, chief investment strategist at Raymond James, thinks this is a good sign though. He said that it makes sense for investors to start cashing in their chips -- so to speak -- with high-flying tech stocks and look more for bargains in other sectors. Saut said that some of the concerns about Amazon and Walmart (WMT) killing the rest of retail are overblown. Strong sales on both Black Friday and Cyber Monday is good news for struggling department store chains, as well as specialty retailers who have been thriving lately, like Home Depot (HD), Best Buy (BBY) and Children's Place (PLCE). Liz Ann Sonders, chief investment strategist at Charles Schwab, agreed that it's encouraging to see a rotation from areas of the market that have been sizzling to ones that have not done as well. The underperforming stocks tend to be cheaper. "Any pullbacks in certain sectors are healthy given how hot the market has been broadly. Something like this is necessary," Sonders said. That could be a reason why transportation stocks were rallying too. They have also lagged the surge in tech. Saut added that the transportation stocks were also getting a lift from the strong GDP number reported Wednesday morning. Economic growth was revised higher -- to the best levels in three years. Saut said a healthier economy outweighs the negative effect of higher oil prices on airlines, truckers and railroads. Crude prices did slip on Wednesday though. Saut said he wouldn't be abandoning techs just yet though. That's because their earnings are still likely to be better than most other sectors this year and next. But Saut and others think that the recent rebound for financials may just be in its beginning stages. 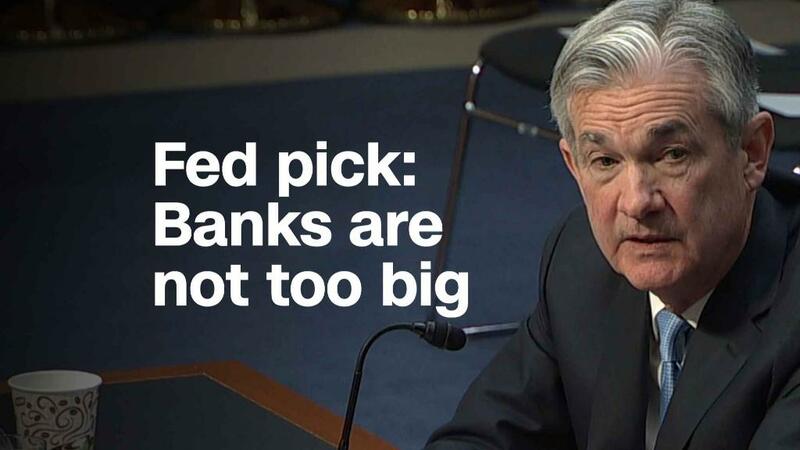 Michael Materasso, senior vice president and co-chair of Franklin Templeton's fixed income policy committee, said the banks should benefit from Powell's Fed policies and the rebound in economic growth. Relaxed financial rules won't hurt either. "The market was impressed with Powell. He spoke like a businessman. His answers were more direct and there was less Fed-speak," Materasso said. "He is Yellen 2.0 on interest rates but more constructive when it comes to deregulation."